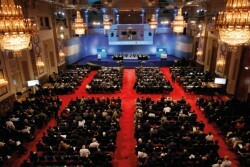 The Organization of the Petroleum Exporting Countries (OPEC) is hosting its 6th International Seminar at the Hofburg Palace in Vienna, Austria, on 3−4 June 2015. The theme of the event is “Petroleum — An Engine for Global Development”. This article includes a total of 1198 words.